LUFT estimates. Backward projection assuming 16K member base after first year. Notes: Member base calculations assume end of year. Calculated median Prime cost of membership for non-U.S. share US$47.39; U.S. maximum member base 126M equivalent to total number of households. U.S. prime market has hit saturation point. Amazon Prime is now available in the U.S., Austria, Benelux, Canada, China, France, Germany, India, Italy, Japan, Mexico, Spain, U.K.
Amazon Prime is both revered and hated as the archetypal loyalty program studied at business schools and strategy board rooms From San Francisco to Shanghai. So what makes Prime so successful? The secret ingredient is pretty simple. Prime pays for itself. Members receive free 2-day shipping on over 100 million items at marked down prices, in addition to other perks including free video content streaming, unlimited photo storage, Amazon Radio and more. The program has a 90% retention rate. "13 years post-launch, we have exceeded 100 million paid Prime members globally. In 2017 Amazon shipped more than five billion items with Prime worldwide, and more new members joined Prime than in any previous year – both worldwide and in the U.S. Members in the U.S. now receive unlimited free two-day shipping on over 100 million different items. We expanded Prime to Mexico, Singapore, the Netherlands, and Luxembourg, and introduced Business Prime Shipping in the U.S. and Germany. We keep making Prime shipping faster as well, with Prime Free Same-Day and Prime Free One-Day delivery now in more than 8,000 cities and towns. Prime Now is available in more than 50 cities worldwide across nine countries. Prime Day 2017 was our biggest global shopping event ever (until surpassed by Cyber Monday), with more new Prime members joining Prime than any other day in our history." Prime keeps getting cheaper, better, and faster. If value is Amazon's sauce, then transforming that value into addiction is its formula for strategic dominance. The company started with books, CDs, DVDs and eventually moved on into video streaming, shoes, furniture, fashion, the category list goes on. More recently, food. The recent Whole Foods acquisition was a synergistic play capitalizing on the company's strengths in logistics, but the real brilliance behind the Whole Foods acquisition may have been its projected impact on Prime member dependency. Brand love boils down to dependency i.e. I want and need it. Beneficial or harmful, perceived or actual, physical or psychological. For a publicly traded company, commanding loyalty is clearly a very powerful thing because it makes cash flow more predictable. Investors love the reoccurring revenue and the compounding effects of Prime on net sales. Volume in shipments for Prime members reached 5 billion items in 2017 - or roughly 50 items per Prime member. Source: Company financials, LUFT estimates based on global Prime membership growth. Prime membership price differences were also considered. Amazon would have technically operated flat in 2017 minus its Prime subscription revenues (see figure). That sub revenue gives Bezos and team extra wiggle room to expand aggressively while reporting a profit and keeping their market cap in tact. Scaling loyalty to Amazon proportions comes at a cost, especially when dealing with non-exclusive inventory. There’s a reason why Walmart is Amazon's biggest competitor. Consumers love a deal and Amazon brings it. The now famous Jeff Bezos quote "your margin is my opportunity" summarizes how Amazon can dominate a new industry. 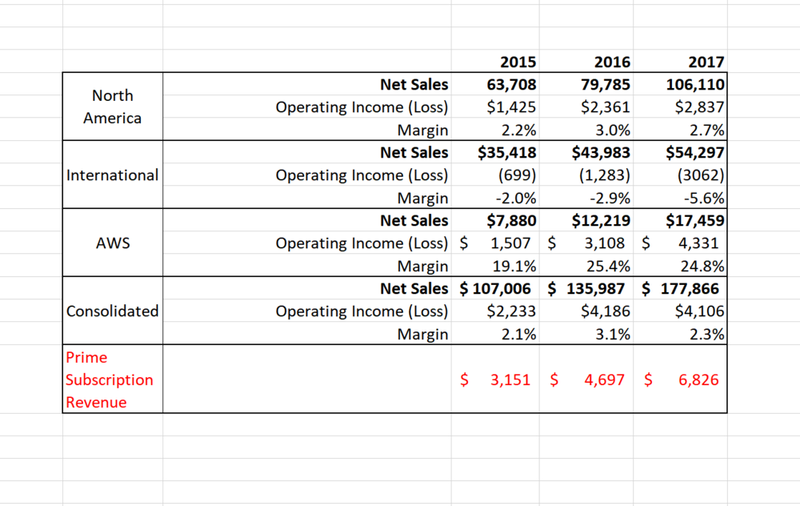 Its North America operations run at a slim 2-3% margin and the company loses money internationally. Investors don't care so much, mainly because Amazon managed to duplicate its Prime adoption successes overseas. Those that work in e-commerce also know where Amazon’s margins come from. Data storage and cloud computing is a lucrative business to be in these days. Losing here and winning there, as long as it promotes Prime adoption and retention. Loyalty. It’s a beautiful thing.